Dr. Donnie Dean Offers Beautiful Crowns in One Office Visit! 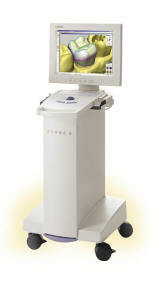 Dean Cosmetic Dentistry uses CEREC 3D®. CEREC technology is revolutionary to dentistry because it creates a beautiful, esthetic, strong and durable ceramic restoration that is precisely bonded to the tooth. Dr. Donnie Dean Offers Beautiful Crowns in One Office Visit! Dean Cosmetic Dentistry knows that a picture is worth a thousand words – especially in dentistry! Their dental team use small cameras right inside your mouth to take highly magnified digital photos of your teeth. These photos can be displayed on a computer screen for both patient and doctor, and are invaluable in diagnosing and recording dental problems. Intra-oral photos also enables patients to view what the dentist sees when their teeth are being evaluated by the dentist. Dean Cosmetic Dentistry is one of the few, select dental offices in Knoxville to have this Cone Beam CT Scan.